Overnight relief. Effective short-term relief from occasional constipation. Relief in 6-12 hrs. 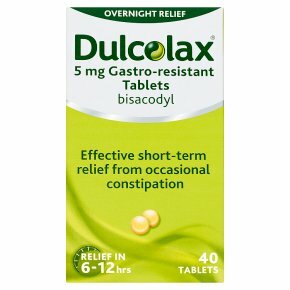 Bisacodyl For the short-term relief from occasional constipation. Dulcolax® Tablets have a special coating that helps ensure the medicine works only where needed. Laxatives do not affect the number of calories absorbed from food. This means they do not help with weight loss. For oral administration.